Any record has the potential for error. Sometimes the reasons are easy to see and easy to understand. Other times they are not. Research is always strengthened when one remains open to the possibility of errors and how they could have taken place. 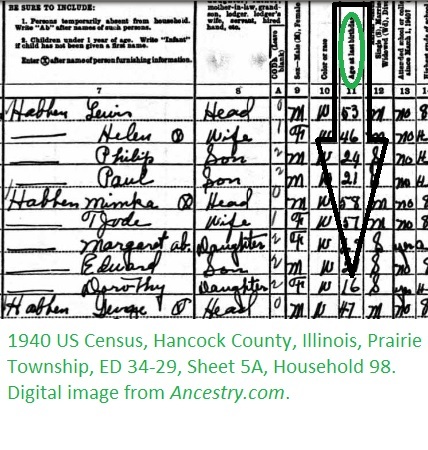 Dorothy (Habben) Ufkes’ 1940 census enumeration is a prime example, albeit a simple one. Dorothy was born on 12 April 1924 in Hancock County, Illinois’ Prairie Township. That’s where the census enumerator found her family on 18 April 1940. Typical for rural dwellers, there is no precise address given, but the family was residing on their farm on the “Habben Corner” a few miles west of Carthage, Illinois, on what is now Highway 136. The ages were to have been given as of 1 April 1940. Dorothy would have been 15 on her last birthday as of 1 April 1940. She would have been 16 though on the day the census enumerator came knocking. That’s probably why her father indicated she was 16 years old. The amount of schooling completed is listed as “H-3,” three years of high school. That might seem incorrect for a girl who would have turned 16 in 1940. It’s correct. Dorothy graduated high school in 1940. At some point in her elementary one-room schooling, she had been promoted more than one grade at a time. Her age is well-established with birth and other records and her high school graduation has been documented as well. Sometimes what looks wrong is wrong. Sometimes what looks wrong is right. It’s up to us to figure it out. It’s also up to us to transcribe the documents as they are written and include our analysis separately. Dorothy (Habben) Ufkes (1924-2008) is my maternal grandmother. This entry was posted in Uncategorized and tagged dorothy habben ufkes. Bookmark the permalink. ← Is There One Universal Spelling for a Last Name? I am not sure why you think a 16 year old girl could not be in her 3rd year of high school. That’s how old I was. I started school when I was 4 years old. Maybe this lady did, too. I had just turned 17 when I graduated from high school. She was not 16 and in her third year of high school. The census asks highest grade completed not the grade in which one is currently enrolled. As of the census date, she had not completed her fourth year of high school–she was in her fourth year of high school when this census was taken. She is known to have graduated in 1940, a few months after she had turned 16.. I understand what you are saying, and understood it when I originally posted. Again, I state that I don’t understand what you find so unusual. Are you just questioning whether she was 15 or 16? Do you know FOR SURE when her birth date was, and do you know how old she was when she started school? I started school when I was 4, although the school system had a ruling that you were supposed to be 5 by September 1st of that year. I was NOT. My mother, who was a teacher, convinced the school system that I was ready and able to start school, and should not be held back. When I started school, I knew my alphabet, could count, and could read. Most kids, who were 5 years old, couldn’t do any of that when they started school. So I repeat – do you know exactly when her birth date was, and do you know how old she was when she started school? And most importantly, do you know the exact question that was asked by the census taker, when he knocked on the door, taking census? We “think” we know what he was SUPPOSED to have asked, but is that actually what he *DID* ask? My great grandparents show up in the 1910 census. PROBLEM: My great grandmother died in 1901, yet she shows up in the 1910 census! 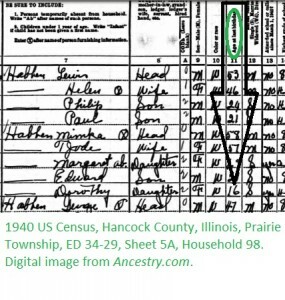 It appears to me that not all census takers were asking the questions they were SUPPOSED to be asking, as i suspect my dead great grandmother didn’t invite the census taker into the house. One of the other ‘maybes’ to investigate is when a child was allowed to enter school. In our town the date when I was young was December 1st, but most districts have moved the date to September 1 (and probably about 45 years ago. Birthdays also make a difference. I highly suspect that was true for my mother too. She was born in 1909 and graduated in 1927…so she would have appeared to be 18. However, her birthday was Dec 2nd. So that June she was definitely 17 at her early June graduation. Her sister was considered to be a year older, but was really a year and 8 months older. She was 18 and almost 2 months old when she graduated in 1926. Just as in other situations, we must know the requirements for schooling. As others have said, the age for entry into school can vary. It can vary by location or time period. In my current county the latest birth date for entering kindergarten was changed from December in one school year and to September for the next year.. Some students may skip grades completely as they are advanced academic students. One of my grandfathers graduated at age 16 back in 1908 having skipped one or more grades. Today some districts still allow rapid advancement. The practice may have fallen almost completely out of practice except for the occasional genius child we hear about on the news. High school did not necessarily end at the 12th grade. My mother graduated in the 11th grade while her slightly older brother had to go for the twelfth at the same school. It had something to do with the 12th grade being added and the high school courses he had already completed when the family moved from another state and the courses required in their new one. My mother attended all of her high school years at the one school. Students who are listed in high school later than one might expect may have missed school due to illness, family circumstances, work, and more. If we dig deeper looking for family letters, journals, and such for explanations.I am fortunate to have heard accounts from my grandfather (first hand) and a valuable tape recording from his brother (my great uncle) recounting more about this happening. I have school records for my mother and have heard my mother and uncle discuss their differing school experiences.Note that age, illness, poor memory, exaggeration can be factors to discount first hand info instead of accepting it. The usual caveats: how long ago did the event occur before the details are recalled, personality (having a habit of exaggeration or even lying), mental or memory disorder, etc. Is one of the youngest members of a family giving a detailed description of events occurring before he or she was born, or before old enough to remember, or about people who died before he or she could have know them, look deeply for more support before accepting or discounting.